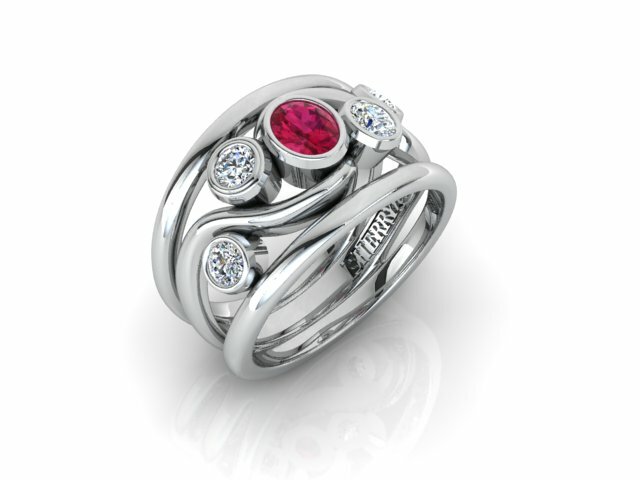 Remodel of old jewellery into new, using a ruby and a selection of differently cut and variously sized diamonds. Our customer wanted a stand-alone ring; something that would have impact, yet be practical to wear all of the time. She opted for 18ct white gold and we offered her a range of designs, all of which were original and unique to her inquiry. Our bespoke remodelling work is exclusive and imaginative; a real cut above the ‘remounting’ service that many high street retails portray as ‘bespoke.’ Our work is protected by copyright.